...... At the high-end you can record to actual CD quality stereo and at the low-end you can record down to 8 Khz mono. The quality is excellent at all settings! Record any type of audio such as streaming Internet radio, audio or video sounds from Windows Media Player, RealOne or any other media player, games, etc. Record the sound from any Internet broadcast, audio or video, whether it's news, sports, music, talk radio or any other format.Record live sound with a microphone. 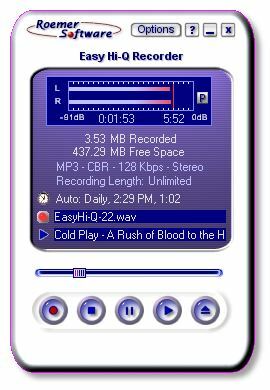 With a laptop, you can even use Easy HiQ Recorder to record meetings, classes, seminars or any event that's important to you.Convert, (record) any type of audio file or media such as records, tapes, CD's, radio, DAT, Mini-Disc, video tape sounds, T.V. sounds, video games, telephone or from any other external device. Burn your data to CD/DVD at 3 clicks! Qweas is providing links to Easy HiQ Recorder 3.01 as a courtesy, and makes no representations regarding Easy HiQ Recorder or any other applications or any information related thereto. Any questions, complaints or claims regarding this application Easy HiQ Recorder 3.01 must be directed to the appropriate software vendor. You may click the publisher link of Easy HiQ Recorder on the top of this page to get more details about the vendor.